This is so amazing. Im finally in the Amazon rainforest! It looks just like u`d see on `planet earth.` Oversized trees and plants as far as the eye can see with heavy clouds and mist hanging randomly over the canopy and the constant buzz of insects. The only way to get to our lodge was by narrow longboat down the massive river Napo, a tributary to the Amazon itself. When we ariived at the lodge there were monkey hanging in the trees outside, and then the rain started. This was rain like i`d never expierienced before, crashing down on the tin roof. All we could do was wait. It lasted exactly 1 hour. Afterwards we headed back down river to an animal rescue sanctuary. It was so hot, humid and sticky -really tropical. We saw loads of monkeys and birds. Just the bugs in this place are awesome - except when they`re on you! Abd the moths and butterflies are the size of my hand, if not bigger. Infact everything`s massive. I went to sleep to sounds of people screaming as they found various bugs in various places. After breakfast this morning we headed out for a spot of rafting on the river Napo. Our guides built the rafts infront of us, out of balsa wood logs, tied together with rope. We all had life jackets but I was still pretty scared as the river was so wide and really fast, and swimming never was my strong point. Once we`d set sail I began to relax. We drifted steadily down river occasionally hitting minor rapids and gripping a bit tighter. Occasionally we`d get in for a swim. It was such an amazing expierience to be swimming down a huge river through the Amazon rainforest. I say swimming, I just bobbed along in my life-vest. And all I could think about was crocodiles. Apparently there were none in this river- How can they be so sure? After lunch we visited a local village. They all live in basic wooden huts on stilts, because of flooding. We saw how the local drink chi-cha was made and a lady doing some pottery from clay from the river. We saw a local balsa wood carver, who carved wooden birds and fishes for tourists. He carved us a parrot in about 10 mins flat. He was so tallented. This evening after dinner, a local Shamen came to demonstrate rituals used to cleanse peoples spirits. They claim to have psychic powers after drinking the drink Iawaska. This drink is enough to give anyone psychic powers! I think it must have rained all night. This morning it was still going, but the jungle hike planned, was still on regardless. Dressed in a bizaar combination af bikinis, welly boots and waterproof jackets, we set off in the rain. Armed with a machetty, our guide lead the way, stopping to point out certain plants and creatures. At one point he lunged his hand into the undergrowth and when he opened it he had one of the smallest frogs ive ever seen on it. About the size of my thumbnail. 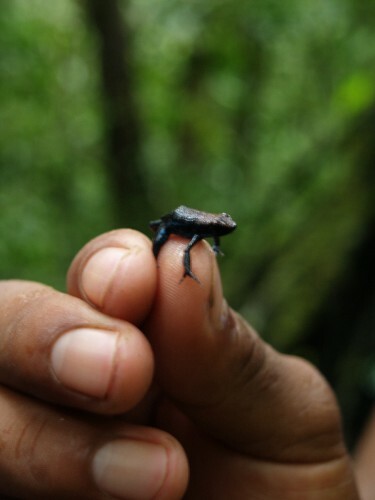 Turned out it was one of the deadliest frogs in the Amazon. We saw loads of spiders, lizards, butterflies and millipedes. We ate some plants and some people ate some ants. Apparently they tasted like lemon- I took there word for it!. I did impress the guide when he showed us how to weave a shelter out of ferns. Remarkably i picked it up really easily. We hiked for a few hours. We could still hear the rain in the canopy but not much was getting through the dense trees to us below. It was easy to feel claustrophobic. Finally we reached a small river. I thought we were just crossing it, but we waded down it for about an hour. Some partd were waist deep - well waist deep on me, knee deep for everyone else! It was so slippery everyone stacked it at least once. It was hard going. After a well earned lunch, we visited a quichua museum to see some traditional animal traps and we got to fire a blow dart. I was one of the few to hit the target! Must be a natural. This evening a local family came to camp to dance and play their instruments. I`ve loved it here, will be sad to leave tomorrow.